The first response that I always have is "What doesn’t"? When I sit down at the easel, sketchbook or just start picking and arranging, I am inspired. I see colour, light, hear sounds, interact with people, glance at facebook or search the web and am always looking for a great book on art. I look at animals, plants, people, the lay of the land and I feel the softness of the breeze or the blast of wind and, from all of these, energy flows to my senses as I begin to make an idea. Sometimes it’s a complete idea and sometimes it is a beginning, but it really doesn’t matter because it’s a start and who knows where you will finish? So in order to create an original idea, that goes on to become a painting, I am influenced by the endless stimuli that surround us every day. These could be natural or man-made objects, animals and plants, light, colours, sounds, feelings, friends, family and strangers; it's a universe of ideas. A walk to the beach, a stroll in my garden, a casual meeting with a friend, birds carolling in the distance or a sunbird twittering away to its mate as it searches for a sheltered spot to build its unusual shaped nest - all of these start the flow of ideas. The two photos, above, that I have selected to include with my journal illustrate the development of an idea. 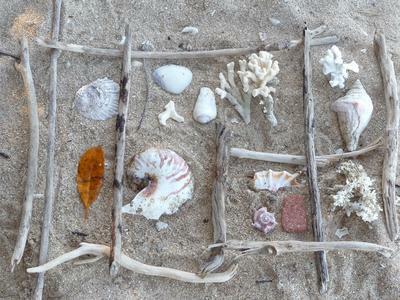 Once, while beach-combing with my wife, we made a finders' composition framed into squares and rectangles of driftwood. I later developed this idea into producing a series of paintings about the ocean and the trappings of nature and man that are associated with this wonderful environment. The other day I was privileged to have a private viewing of Terry's new body of work for his up-coming exhibition in Robe. How exciting that was! 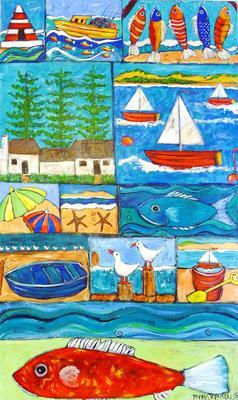 Beach scenes, birds and boats in a happy 'holiday' mode fill the canvases in grid patterns reminiscent of Terry's beach 'sculpture' that he describes here. The paintings have been packed into Terry and Nancy's large van and are now cruising along across half a continent. Enjoy their unveiling in a couple of weeks if you are in the vicinity. Terry, I know that you will be very busy organising the exhibition but could you please post photos of some of the new paintings when you have a moment? I am asked many times, "Why don't you paint portraits?" I reply I am not adept at them and prefer not to paint them. "But you do - - - -" Endless options from them. My preference is landscapes, lighthouses, farms, nature. I see a scene and am inspired. A picture captures my interest and the seed is planted. I develop a visual picture of what I will paint and it builds from there. As for the time I saw a photo of Cooya Beach from Jill. I had 'the calling' - "paint me". I forwarded it to JILL. From there it is history. I enjoyed the challenge and the result. Some general in history said, "I saw and conquered." I saw, I SAW AND PAINTED. The following writing belongs in the past, yet your beach sketch reminds.. When she took her dog with her and ran along the grassy shelf above the sea coast, Morag felt happy and at home in herself. Taking a narrow, winding trail to the sea, she would lay down on the sand among the shells and sticks and create random designs with her fingertips. Leaning on one elbow, she studied the beachwrack gathered in strands among the pebbles. There were long, dark green curls of salty witches hair and bits of wood cast among a variety of empty shells and feathers from pelagic birds. She gathered a handful of twisted sea grass and a few twigs...laying them down beside her in a pattern she didn't recognise. Tying a few sticks into a sort of mat, she began to envision lines and grids, pathways and pattern. A few of the white whorled shells had been bored through and a perfect round opening was left in the small, chalky vessel. Finding it easy to thread the wiry grass through the holes in the shells, Morag tied them to the sticks, creating a constellation of bright, unmoving stars. Her border collie came over to investigate the little sculpture which rested across her hands like a plate or tray. Laying back against the warm sand and stones, Morag held the latticework above her head and looked through the openings in the airy screen at the periwinkle blue sky. The sun was hidden by her left hand shading her eyes. When she moved her hands, the sun came in and shone through the outline of a triangle in an upper corner between some shells and the tied sticks. It was as though she was watching something foreign through a crystal lens, yet this object was hers, it came from her. Morag whistled for the dog to come in and by, and then standing up, holding her collage, she walked across the bright, hard ribbed sand to the waterline and kneeled down allowing the cooling aventurine sea to wash around her bare legs and feet. Holding her featherlight burden above the thin waves the raft was set adrift yet held back by one finger looped through a blade of grass. Crouching down, the horizon rose up and the mauve islands in the distance almost sank into the sea. Swirling frothy edges of incoming waves caused the little raft to rise and fall as an anchored boat would do, resting on the surface of the water. A flotilla of black murres had gathered a little way offshore, sailing past like a feathered carpet in silent observation. This was a map of the sea and of the stars. Hi... love this sketch from your beach ramblings... reminds me of a 'shell map' used by islanders for navigation..